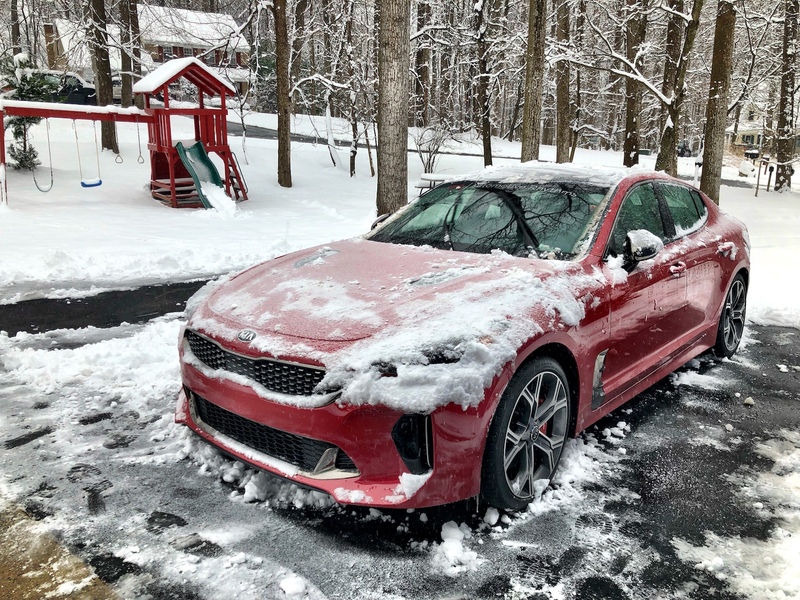 Speaking from experience, when you possess the keys to an AWD sports car outfitted with proper rubber, making moves in inclement weather will never be a problem. Specifically, the wintry weather in the Northeast has been frigid, freezing, snowy and icy. Typically owners would have garaged their sports cars for the season. 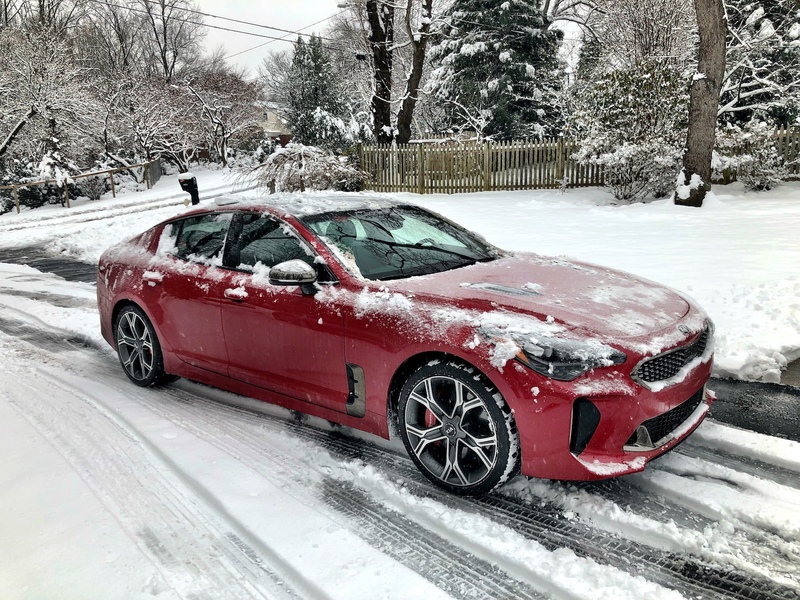 Well, not I since Automotive Rhythms’ Hichroma Red Kia Stinger GT2 long-term loaner is blessed with all-wheel drive (AWD) and outfitted in Michelin Pilot Sport A/S 3+ ultra-high performance tires which replaced the previous Pilot Sport 4s that were engineered internally alongside Kia technicians. 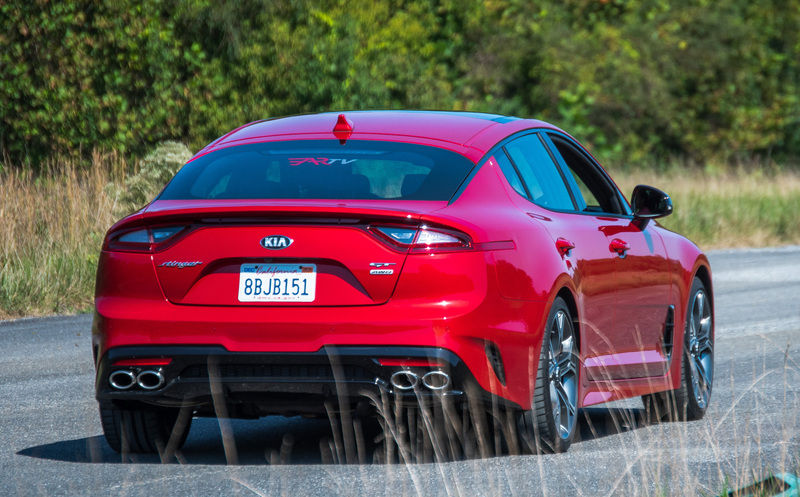 It’s been almost a year evaluating the Korean fastback and the experience has been such a delight. 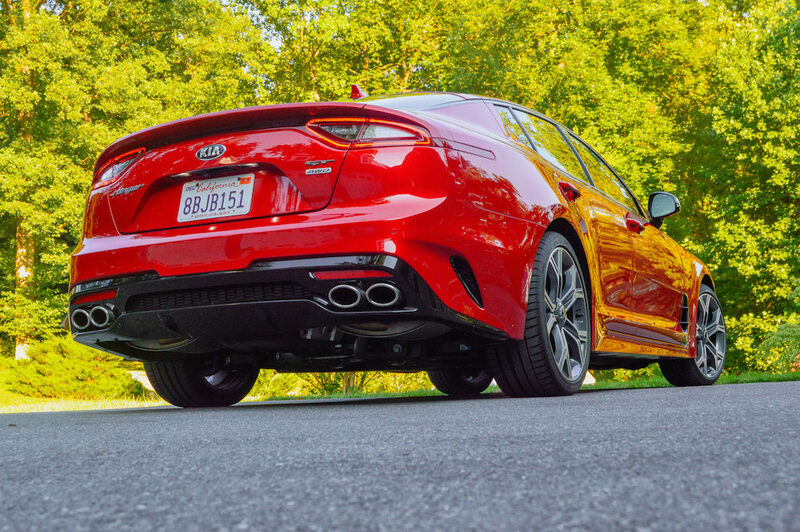 There were many instances where I chose the Stinger over other sedans in the fleet given that the hatch area allowed me to operate the sports car as if it were a crossover. Smart Trunk is a plus for occupied hands and the 40.9 cubic feet of space (with the seats down) basically turns the Stinger into a wagon. I have been to Lowe’s for large supplies, our county recycle center with elongated items and on extended highway trips with holiday gifts for a family of ten. The sporty hatch came in handy again when it was time to store the kids’ sleds in route to “snow bowl” for an afternoon of slushy sliding. When it snowed aggressively I still had to get around town, and the combination of rear biased AWD with Dynamic Torque Vectoring technology (up to 50% of the torque can be sent to the front wheels when needed) and all-season 255/35R19 Michelin footwear kept me on course. I would have preferred winter tires which have extra sipes to maintain icy traction and remain soft at lower temperatures, but the A/S setup performed the duties sufficiently for the tasks needed. In fact, I was surprised that there was no wheel spin on the crunched snow in my driveway. Maybe because the Michelin Pilot Sport A/S 3+ is enhanced with an advanced Helio+ tread compound focused on light-snow traction. Interesting enough, the tread compound incorporates sunflower oil and Extreme Silica Technology to support low temperature and wet road traction. 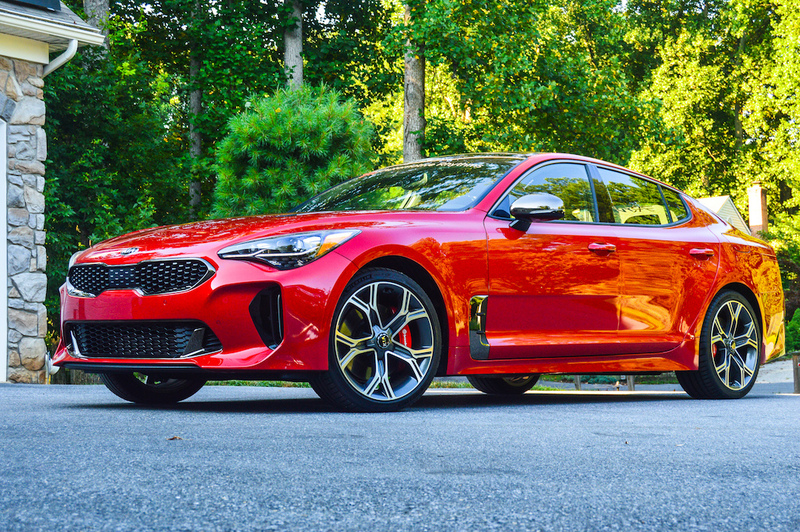 The Koreans have nailed the grand manifestation of the Stinger which was designed in Frankfurt and developed on the famous Nürburgring located in the town of Nürburg, Rhineland-Palatinate, Germany. 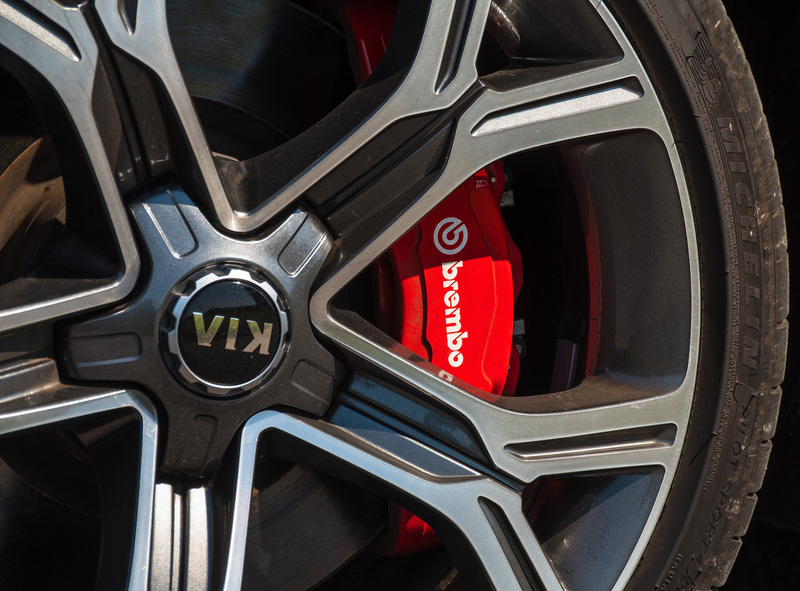 The 4-door sports car’s aggressive styling is paired with roller-coaster handling, adrenaline-charged acceleration and assertive stopping power from 4-piston Brembo Brakes with brake fade compensation and brake cooling vents. More importantly, the Stinger GT2 is backed by a 3.3-liter Twin-Turbo 365-horsepower and 376 lb.-ft. of torque V6 that hits 0 to 60 mph in 4.7 seconds and can reach a top speed of 167 mph. 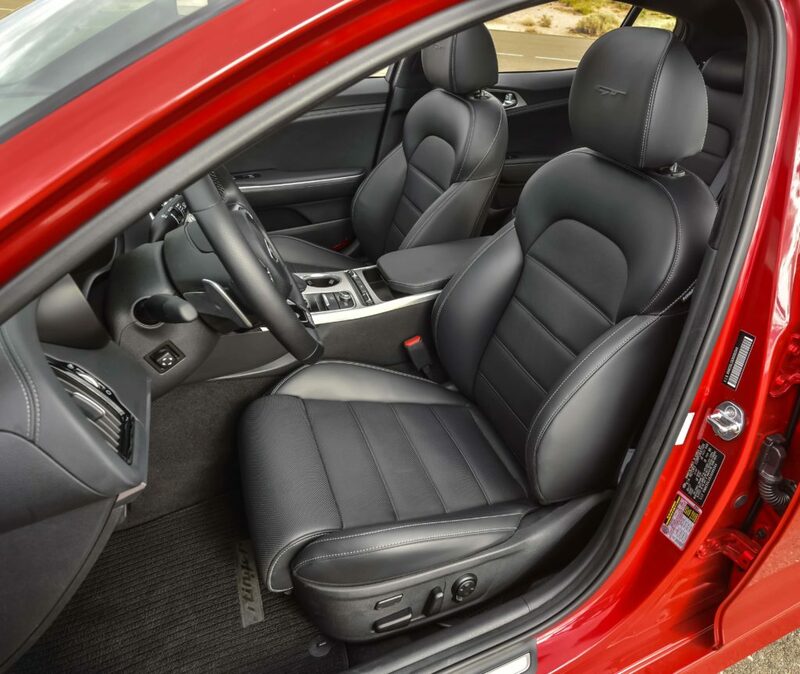 The engine is coupled with an 8-speed automatic transmission with paddle shifters. However, speed was not our focus during December and January driving. For example, I kept Drive Modes mainly in the Eco, Smart and Comfort settings opposed to Sport or Custom. My only gripe is that the V6 uses fuel quicker than I would like. Frequent winter gas station stops are nothing to be cheering about. 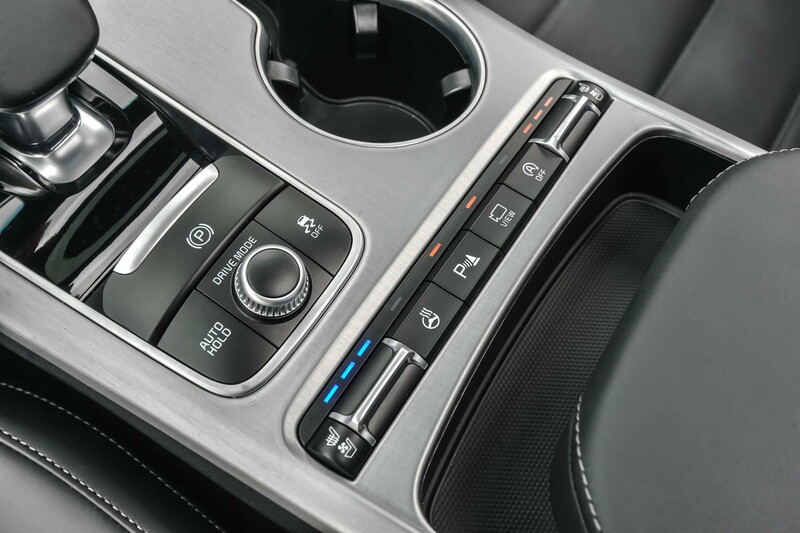 Inside, the Stinger features heat warmers, steering wheel heater and a dual zone auto climate control system that toasted the cabin rapidly. The vehicle also sends alerts when snow is in the forecast. 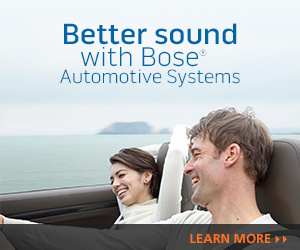 Safety is presented through 18 driver assistance sensors and various assistance systems such as Driver Attention Warning, Forward Collision Avoidance with pedestrian detection, Smart Cruise Control with Stop & Go, Lane Keeping Assist, Blind Spot Collision Warning and Rear Cross-Traffic Collision Warning. For every foreseeable environmental disadvantage, the Stinger produced a vantage to counter with. It’s always like playing automotive chess when I take the Kia out for a spin!